Ya’ll, my mom is coming this week! She has to eat all the pasta, drink all the wine, and spend all the time with grandkids. I’ve discovered that I can just barely squeeze between the carseats so we have plans to visit gardens and we just booked a trip to Tuscany. I won’t be able to feel my legs, but it is going to be legend – wait for it and grab your pizza – DARY. All of this means she needs to hit the ground running. Which is not easy to do when you are six time zones off your game. Also, unfortunately, traveling east is harder to recover from. 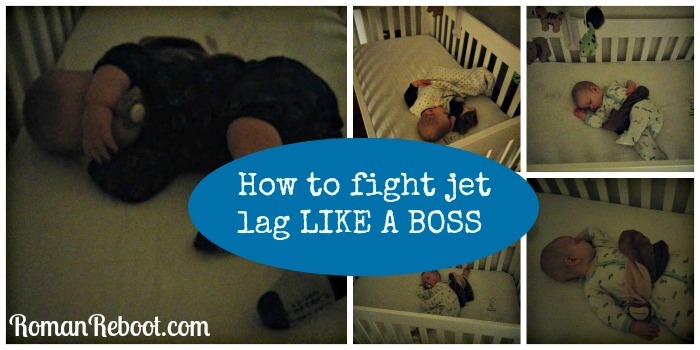 To come up with a game plan, I took to the internets to devise a foolproof jet lag battle strategy. Here’s the best advice I could find. Prepare before you go. Some suggest shifting your schedule before you go. Others say–and I agree–that there is no point giving yourself jet lag before you leave. My mom is a busy lady. She doesn’t have time to mess around with schedule shifting. On the plane. Sleep is a good strategy. Some suggest sleep aids, but my mom is a little crunchy and she won’t have time to test these before so drugs are out. Busting out the noise canceling headphones and sleep mask could help. I know your vacation starts on the plane, but avoiding caffeine and booze should help. Drink water like it’s your job. And jump into your new schedule on the plane. Several sites recommend resetting your watch immediately when you board. The jet lag is all in your head, Cricket-san. At arrival. My mom’s flight gets in at 8:00 AM. That means she has a long day ahead of her. The answer seems to be sunlight. The internets tout sunlight as being one of the best ways to hasten your transition. But not just indiscriminate sunlight. For my mom, an eastbound traveler, she should avoid morning sun and get afternoon sun. Science types even go as far to wear sunglasses on the plane and at arrival to limit morning sun. My mom likes the sun. And sunglasses. If we can keep her from napping, it shouldn’t be hard to get her outside in the afternoon. Hopefully we won’t be having another rainy day. Some suggest faking the sun by taking melatonin. I don’t see this being in our strategy though. One, crunchy. Two, if you mess up or mistime your dose, it could actually set you back on your jet lag journey. Bringing our “A” guest game could help my mom as well. We’ll have the room ready with the light blocking shades and comphy sheets. When it is finally time to sleep, I’ll do everything I can to make it a good night. Absence of crying children sadly not guaranteed. So that’s the plan. Hope my mom isn’t burning the candle at both ends getting ready, promise her plenty of wine in Italy if she can avoid on the plan, and run her ragged in the afternoon sun when she gets here. I have trained minions who excel at running people ragged. Ideally, my mom would power through Day 1 and go to bed close to a normal time. If she’s majorly flagging, we may negotiate a short nap. Sounds fun, right? OK, ready, break! Ya’ll my mom is coming!!!! Any other jet lag fighting words of wisdom? I’ll let you know how it goes! Jet Lag is the worst – l never have it heading west, but east always takes me a week or so to adjust. All the above advice is great!